On Amazon right now you can get this nice U.S. Polo Assn. 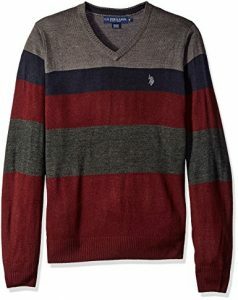 Men’s Stripe V-Neck Sweater, Granite Heather for only $33 – a 45% savings! This will ship free with Amazon Prime or qualifies for free Super Saver Shipping with a $49 purchase.